Red Coat (also Redcoat) is the historical term given to the British non-commissioned men who served during the American Revolution, between 1775 and 1783. 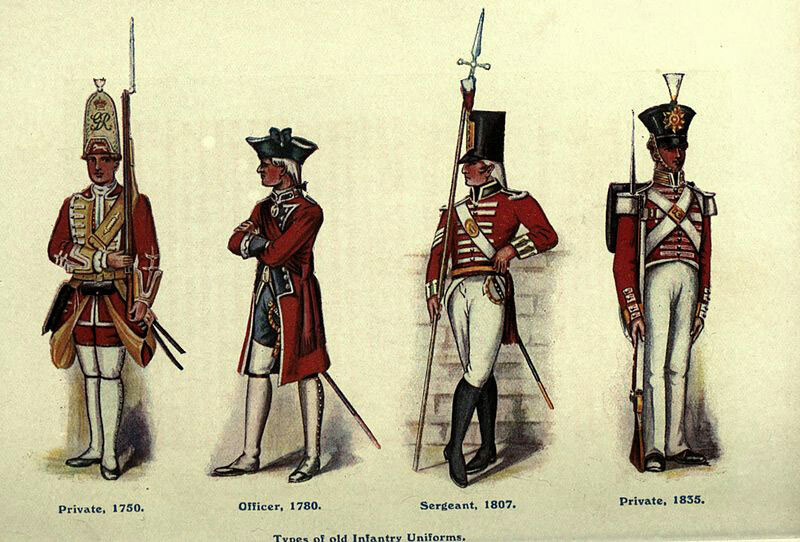 The British Army soldiers between 1760 and 1860 wore red uniforms and fought in the Wolfe’s war, the defeat at Quebec, the Wellington’s Peninsular War, the Waterloo conflict, the Kabul retreat, the Crimean War, the Indian Mutiny, the Georgian war, and also in the Victorian England conflict. In the American Revolution, the Red Coats fought against the American rebels, militia and their Spanish and French allies of North America in the battles at Canada, New England, New York, Philadelphia, Virginia, and also in Florida and the West Indies. Apart from the British Regular Army units, the Red Coats included German Auxiliaries, militia, West Indian Forces, Local Volunteer Corps, and Provincial Units assembled from the Loyalists and Canadians. The Red Coats of the Revolutionary War was a semi-professional force, trained only for conventional European warfare. The British Army was relatively small in stature by European standards, but supposedly superior to the inexperienced militia forces of the Continental Army initially available to the Patriots. In the beginning of American Revolution, the British army was about a total of 48,000 men composed of around 39,000 infantry units, 7,000 cavalry units, and 2,500 artillery men. These numbers looked large enough, but America was different than Europe and the Red Coats suffered from in-effective recruiting methods. The vast countryside, trackless wilderness settlements, non-existent roads to little villages made it difficult to effectively control the entire colonial area. Most of the Red Coat soldiers forced into this unfamiliar environment were professional men, enlisted in the army for life. They came from the lowest social order, and most of them were ex-convicts with no prior civilian life and referred as “scum of life”. Their regiments were their homes, and they were asserted by harsh discipline. Apart from the convicts, the British government had high difficulties in recruiting regular soldiers, because the cause and terms were not appealing enough. They tried various different ways to recruit during the revolution at Britain only in vain. Their only recruitment success came by hiring German mercenaries for the war. Though the Red Coats were disciplined and superior in maneuvering, their skills were wasted by in-effective war strategies facing the American militia who had been drilled to work in the harsh environment. While the British Army tried to enforce strict discipline, the Red Coat men had little self-discipline in themselves. Gambling, pandering and fighting over local women, corruption and heavy drinking were very common. The Red Coats also had to endure out-of-place logistics, food supplies and artillery replenishment. Many Red Coat officers during the revolution came from the upper class purchased their promotions and commissions using family connections instead of valor on the battlefield. Most senior officers often drank too much on occasions like Christmas. Their strategy was good while expanding the Victorian empire, but once settled as colonies, they had difficulties containing the conflicts with their own brethren. Generals of the Red Coats were usually members of the ruling elite or politicians with an aristocratic background. Many big names like General Burgoyne, Cornwallis, Clinton, and Howe were all senior members of Parliament gaining them both Political reliability and military capability. After the French and the Indian wars, a major portion of the British garrison remained in America. They had to replenish supplies and continue recruiting, which was not an easy job in the 18th Century America. They often used enforced strict practices and fraudulent recruitment methods. The Red Coats were very unpopular in the towns and small villages of New England and ‘Old’ England both. The French was put a strain on the relationship between the Red Coats and their provincial colleagues. These small bickering were the spark for Generals like George Washington to start revolting against the Royal Army. The Red Coats had serious difficulties fighting the Revolution. Compared to the American militia, the British had no major local supporters of the war, and their only troops were provided German Hessians. Inexperienced officers who had no military capability who had purchased their commissions diluted the effectiveness of their responsibility. Distance was also a major problem for the Red Coats, both on the continent and across the Atlantic. Although the British Royal Navy was at its peak during the American Revolution in terms of strength and experience, they usually took about two months to supply fresh troops which made them out of date with the completely different military situation by the time they arrived on land. Their artillery also proved to be inferior when compared with the improvised American munitions. Even when the British were winning some initial conflicts over the Continental soldiers, the Red Coats had difficulty in occupying the captured areas due to lack of numbers spread over the vast areas. Thus suppressing the rebellion in America posed major problems for their strategy. Though they had the local Loyalist support in some regions, they were often packed away by the Patriot militia men because of the absence of armed British regulars and Army men. The arrival of French, Spanish and the Netherlands Armies forced the British Army to spread further instead of focusing on one task. Waning Loyalist allegiance to the war, neutral colonies drifting towards independence and an uninspired British Army made the retreat much quicker. I really liked this website to use for a class project. I had to pretend I was a reporter and I had to interview a british soldier. I like to use the facts from here because they helped me describe the clothes and other various things. Thank you so much. were the redcoats fighting for personal reason,a monetary reason, or a moral reason? please help! :! At some point during the course of the war, members of the British parliament did try to make use of slaves, fighters from India, and mercenaries from other countries to fight against the Colonists. The answer to your question; some fought for love of country, others fought to survive and make a living. i like lobster for dinner! !